If you follow me for some time then you know that I have a thing for shoes and vintage pieces. I'm always on a hunt for a good pair of shoes. It's difficult to find ones that are super comfy and beautiful at the same time. That's the reason why block heels saved my life. Good thing is that that particular sort of heel is popular right now so you won't have any problem finding pretty ones. For the quite some time I have a slight obsession with metallic and sparkly shoes! Everything started with my Kurt Geiger shoes after that I just started ordering more and more metallic shoes. This time I went crazy with these red ones! They are from some weird shimmery knit. They are quite comfy but the heel is a bit higher than I expected. It was a real challenge to style it in a right way. I think I went with the most riskier option. I wanted to pull off an elegant and chic look and I think I succeeded. Before this, I would say that ankle boots are a big 'no, no' to style with pleated skirt, but now I can say that this is a perfect match! I love how everything goes well together. We have a plaid blouse with bell sleeves and they have a red tracery on it which perfectly goes with red ankle boots. We have a pleated skirt that gives a Parisian touch to the whole look. It's chic, classy and elegant. That's all I wanted from this look. 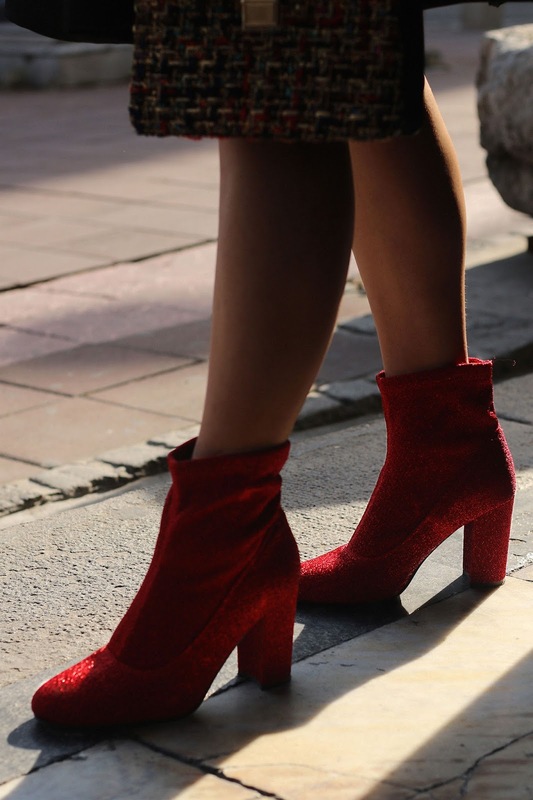 How would you style these ankle boots? Did you like them? Loving the red boots. They look so glam. I bet they brighten up any day. I love the top and skirt. Those 2 are pieces I would wear. Beautiful shoes and they set off the whole outfit perfectly! I just bought something similar (at least shape wise) so now I feel good after seeing these! I wouldn't have thought of pairing it with a skirt but you've given me the nod that it looks great! Your statement shoes are so gorgeous. Perfect for your outfit. You looks so beautiful. Loving your red boots. Those shoes! Wowzers. I love them and it goes well with the entire outfit. I definitely need to get me a pair. I love your WHOLE look - the blouse, boots, bag everything!!! This is a really cute look! I never would have considered a bight colored shoe with a monotoned outfit, but it really works! I love the texture on those shoes! It really does pull the whole outfit together nicely. Love the outfit! The shoes look great with that pop of red. Those booties are definitely making a statement! Sassy! I am all about a great statement shoe and think they can give any outfit a unique touch. Those shoes are stellar. Love the color and outfit choice! OH my GOSH I NEED these boots in my life!! This winter I want a pair of red boots and a pair of blue ones! Your red boots looks so classy and chic. I really love the color and the style. Love this post! Those boots are my favorite. Love your style.